It’s time to update you on what’s going on. I hope you enjoyed the ink drawings I posted up last week. This week I’m taking you through some work I’ve done in the last year. My work is in a very new stage as I am putting my patterns to work in portraits, still lives, and landscapes. The first portrait I made, during college, was created with inspiration from optical mixing and divisionist ideas. 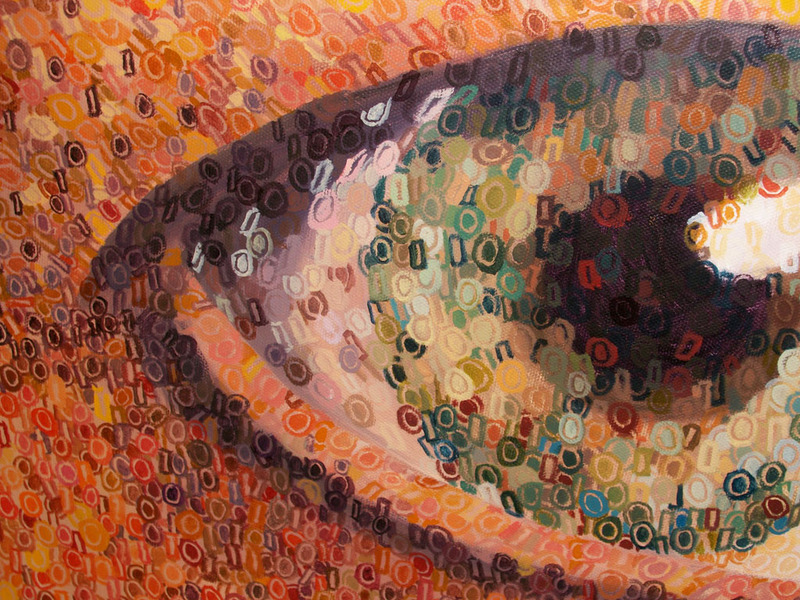 Using the shapes of binary numbers, I created movement along the face with an optical mixing of colors throughout. Below are two views, one up close and one further away. 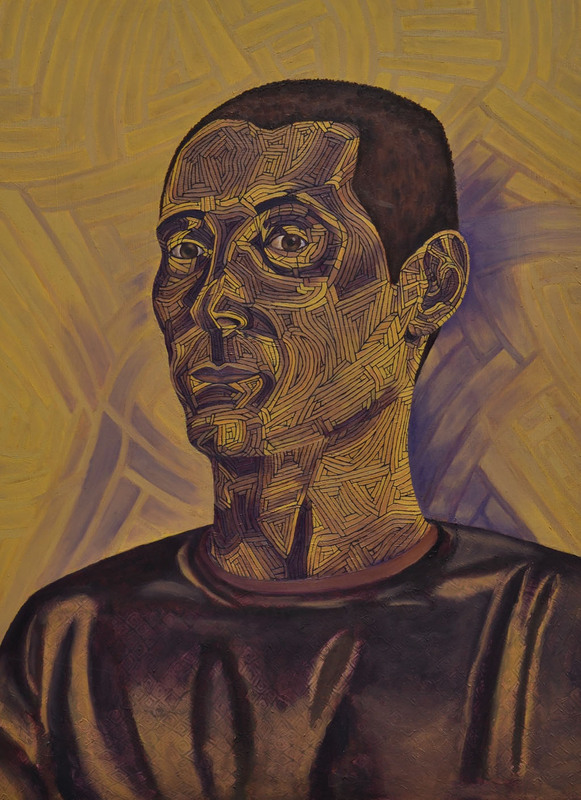 I was approached with the idea of a portrait with pattern by none other than the sitter himself, Peter Morris. After seeing my line work, he thought it would be really cool to have his portrait handled in the same manner. In my previous binary piece, I created volume by treating the face as a sculpture surface in which to lay my numbers on in a collage-like manner. Each number helped to define the shape it was on. I realized that the pattern would have to be treated differently, instead of collaging patterns together – I decided to arrange them side by side. 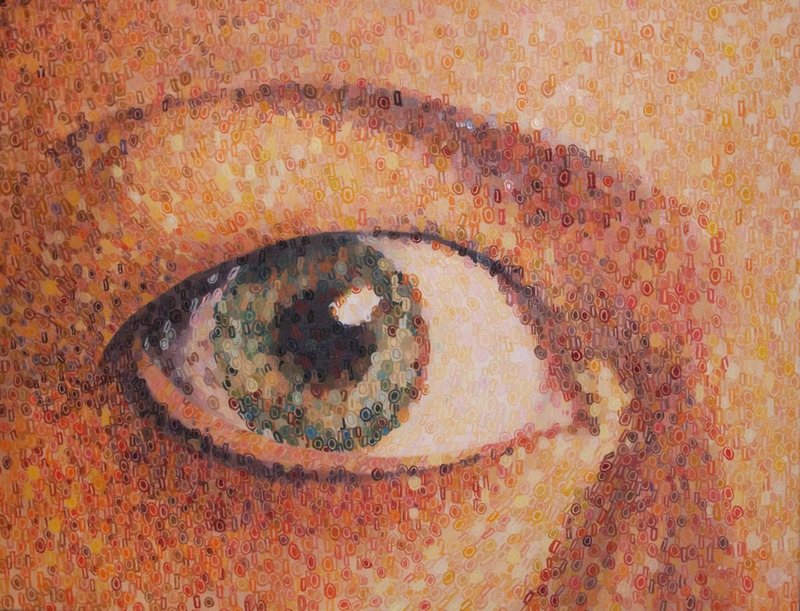 Below – you can see one of the self portraits I created in order to better understand how to go about it. 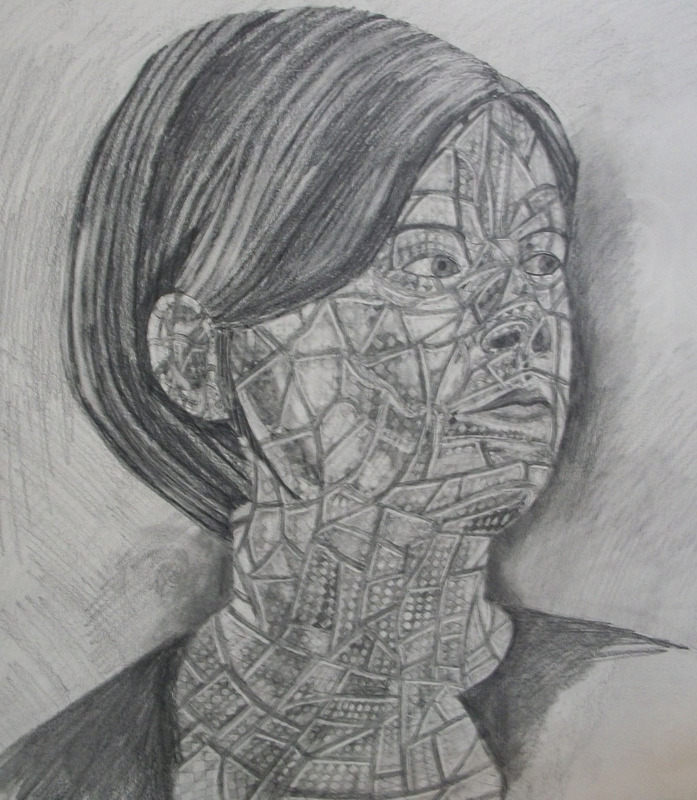 Done in pencil, this portrait has been divided into lines that are raised above the patterned surface of the face. As you can see, I kept the color to a simple yellow/purple complimentary system. Putting warmer colors in the face and sweater helped to make Peter stand out against the cooler tones in the background pattern. In my original drawing of Peter, I noticed that the highlights and lowlights of the face created really interesting shapes in which I could place intricate patterns in. I used this as a way to create the subtle shifts in shape and color along the skin. You might have noticed that I left the eyes without pattern. I wanted, overall, for Peter to be the focus of the painting. The eyes stand out so that the viewer can have a connection to the sitter. That is also why, I stayed as true as I could to his form as well. I wanted to create a calm balance so the work becomes one whole piece, pattern and person. Thanks goes to Peter for giving me the initial idea and feedback throughout, and thanks to my loving husband Matt who was so patient throughout the process! Well, I am signing off for today! Hope you all liked the paintings. Please feel free to leave comments.